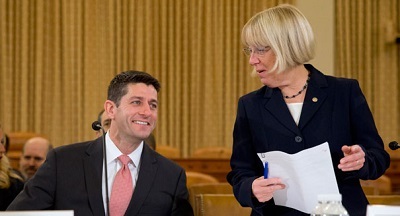 Paul Ryan, Patty Murray a few billion apart. Republicans will agree to cut benefits for government employees. They’ll agree to increase user fees, which are regressive. But they won’t raise taxes on hedge fund managers or close tax loopholes. Republicans are winning at shrinking government: the sequester. Looks like Murray is gonna agree to a terrible deal. Perhaps there’s no other option: the sequester is bad too — though at least it cuts military spending.